Well, OK, I’ll talk football for a minute. Because I could never give up my Irish football. But that’s not what I’m really talking about. I’ve written before about my dismay that my alma mater invited President Obama to speak, and to be honored, at this year’s Commencement. As I said, that won’t impact my enjoyment of football games. But it does impact my opinion of the University. It impacts the guidance that I give to my own college-bound child. Notre Dame’s invitation to President Obama is not an isolated incident in the University’s history. Instead, it is the culmination of thirty years or more of accumulated activity, at Notre Dame and other colleges. I saw some of this for myself twenty-one years ago when I was a student there (but let’s not dwell on the length of time that has elapsed since I received my degree). 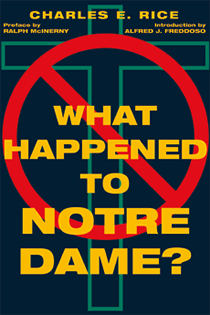 The rest is detailed in Notre Dame professor emeritus Charles E. Rice’s book, What Happened to Notre Dame? Newly published by St. Augustine’s Press, the book also demonstrates that what has gone on at Notre Dame is symptomatic of events at other religious institutions of higher learning. I recently received a review copy of this book and, though I’ve only just begun reading it, I’m finding it fascinating and disturbing. I’ll definitely be discussing this book in more detail as I finish reading it. But I can tell you right now that if your interest in Notre Dame is not limited to its football team, you might want to pick up this book.